Fried chicken (like any other fried food dish) is high in calories. When well prepared, fried chicken can be very hard to resist. Juicy chicken, enveloping the bone for a fine flavor, wrapped in a crispy, greasy and salty crust is definitely to indulge the senses. When it comes to parts of chicken used, breasts and wings are usually excluded. Breasts for being very difficult to prepare, and wings for not supplying enough meat for the meal; whereas, drumsticks can offer quite the contrary. Some recipes require controversial removing of the skin - it doesn't crisp up properly under the coating, and can get rubbery. 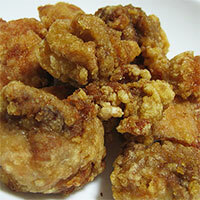 Fried chicken prepares floured or battered and then pan-fried, deep fried, or pressure fried. The breading adds a crisp coating or crust to the exterior. Depending on the coating and general way of preparing fried chicken, to accommodate a person's taste, there are many types of fried chicken throughout the world: Barberton Chicken (Ohio), Chicken nuggets, or even Ayam goreng (Indonesian and Malaysian), Chicken katsu (Japan) and many more. Being greasy and salty, and easy to cook, fried chicken goes well on picnics, barbecues and fast food restaurants. with a fair amount of fat and calories, fried chicken should be ingested moderately. The calories in Fried Chicken per 103.5g(3 medium sized pieces) is 300 calories. Fried Chicken is calculated to be 290Cal per 100 grams making 80Cal equivalent to 27.59g with 24.48g of mostly fat、13.59g of protein、3.66g of carbohydrates in 103.5g while being rich in vitamins and minerals such as Vitamin K and Selenium.